Hawaii's motorists buckle up at the highest rate in the nation, according to state Department of Transportation figures released yesterday. From June 1 to 13, seat-belt use in the state rose to 95.09 percent. Hawaii is the first state to reach such a high usage rate since the national campaign began in 2002, state officials said. "Hawaii's new use rate for 2004 is now officially the highest rate of any state in the nation, and we applaud Hawaii for that accomplishment," said David Manning, regional administrator of the . 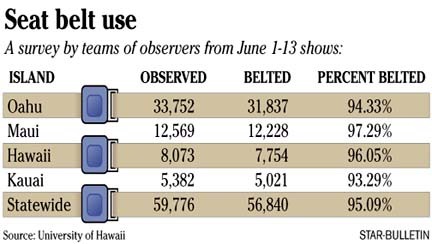 A statewide survey conducted by teams of observers from the University of Hawaii shows all four counties improving over last year's seat-belt numbers. Maui County has the highest usage at 97.29 percent, followed by the Big Island at 96.05 percent, Oahu at 94.33 percent and Kauai at 93.29 percent. In last year's survey, Hawaii ranked second in the nation behind Washington with a 91.8 percent seat-belt usage rate. "For a state that already has an extremely high seat-belt rate, this increase is a great achievement," Department of Transportation Director Rod Haraga said yesterday in a statement. Statewide, police issued 3,169 tickets for seat-belt violations during the two-week Click It or Ticket campaign from May 24 to June 6. Last year, 3,598 tickets were issued during the campaign. "Citations have gone down and that's what we want," state Transportation spokesman Scott Ishikawa said. "We're not interested in collecting the money for the tickets; we want people to be safe." Seat-belt use is mandatory in Hawaii for drivers, all front-seat passengers and rear-seat passengers younger than 18. Hawaii's child passenger restraint law requires children under 4 to ride in a child safety seat in the back seat. Seat-belt violators face a $77 fine. Citations for violating the child passenger restraint law cost between $100 and $500, depending on any history of prior violations. Ishikawa said that of the 83 people who died in motor vehicle accidents in Hawaii last year, about half of them were not wearing seat belts. The figure does not include pedestrian deaths. "Once you're ejected from a car in an accident, your chances of surviving drop drastically," Ishikawa said. "Using your seat belt is one of the best things you can do to protect yourself in an accident." More than 30 bars, restaurants and nightclubs will participate in a summer program to discourage drunken driving by offering complimentary soft drinks to designated drivers. The Department of Transportation's Designated Driver, or "D2," Campaign began Monday and will continue through August. The campaign is a joint effort on behalf of local radio stations and nighttime establishments to promote safe drinking habits among 21- to 35-year-olds. Of the 133 traffic fatalities in Hawaii last year, 68 were alcohol-related. Businesses participating in the campaign are Aaron's, Bedroq Bar & Grill, Big City Diner, Blue Tropix Restaurant & Nightclub, Brew Moon Restaurant & Microbrewery, the Cellar, Compadres Bar & Grill, Dave & Buster's, Gussie L'amour's, Hard Rock Cafe, Hula's Bar & Lei Stand, Indigo Eurasian Cuisine, Irish Rose Saloon, Kahuna's, Kapono's, Kelley O'Neil's, Kemo'o Pub, Kincaid's Fish Chop & Steak House, Magoo's Pizza -- University, Ocean Club, O'Toole's Irish Pub, Palomino Restaurant, the Pipeline Cafe, Reign, Rick Rock Productions, Rumours, Ryan's Grill, Sarento's Top of the I, the Shack (Hawaii Kai, Mililani), Tropics Kailua, Volcanoes Nightclub, Wave Waikiki and Zanzabar Nightclub.